Waging war and pursuing peace has defined human civilization, both ancient and modern. Join us for a thought-provoking conversation entitled “War & Peace in a Dangerous World: a Primer” led by social studies teacher Bill Britton on Thursday, January 24, 2019. Register now! Bringing to bear his own experience as a teacher, writer, and Marine Corps tank company commander in Vietnam, Britton will examine the phenomenon of war from multiple perspectives—from the standpoint of warriors who fight on both sides of a conflict, families and friends who suffer the loss of loved ones, civilians caught in the crossfire, and political and military leaders who make the decisions that lead to both war and peace. 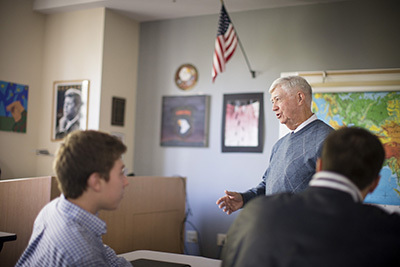 Based on the popular elective he designed and has taught at St. John’s since 1998, the conversation will focus on American foreign policy from the Cold War through the War on Terror and other contemporary military engagements. Using a multimedia approach, Britton’s presentation will offer the opportunity to engage with this important topic and open a window into the kind of inquiry that unfolds in classrooms at St. John’s Prep every day. His presentation is one in an occasional series called Classroom Takeout.